When a group of #VegasTech community members gathered to revitalize VegasTech.com, one of the most important aspects of the project was having a comprehensive calendar for all of the awesome events happening in the Las Vegas tech community. From conferences on The Strip and networking luncheons, to community speaker series events and developer meet-up groups, the group agreed this was a big task at hand. Luckily, a Vegas-based startup called Tabeso came to the rescue to produce this amazing calendar! With so many community calendars floating around Las Vegas, it’s clear why the #VegasTech community was in need a place to go to find it all in one spot. Joe Herrera says when you have so many moving parts and groups associated with a community, a system which allows each group to keep a separate calendar while linking them all together in one central place is ideal. “In addition to that, I think it’s really cool that you can pull up the full calendar on your phone here and be able to share any event on Facebook, Twitter or via text,” adds Chad Ramos. 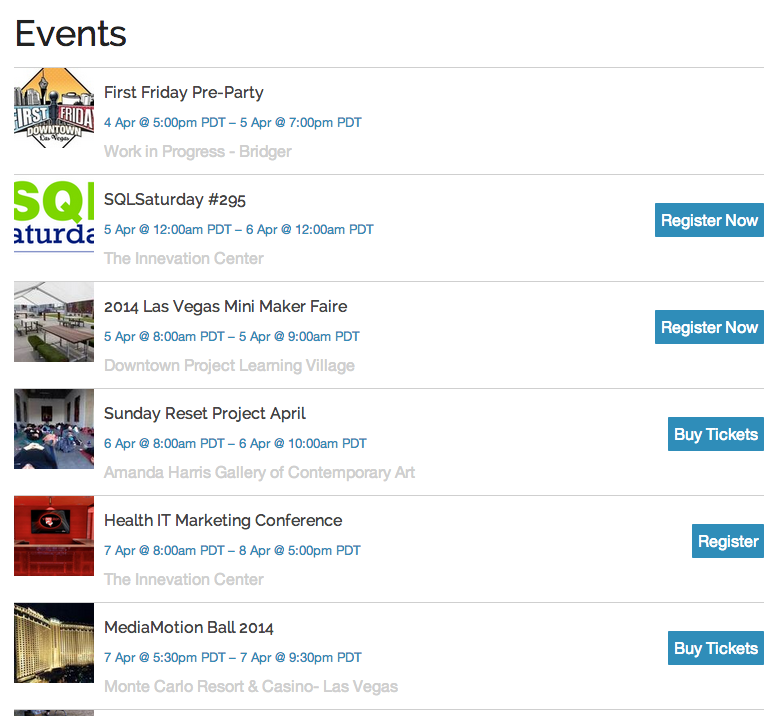 Don’t see your event listed on the VegasTech.com event calendar? There are a few ways to get listed. About Tabeso: Tabeso is the best way to Discover, Share, and Attend events all over the world. From farmers markets or plays at your local park, all the way to the largest mainstream concerts and sporting events. With Tabeso, you have a one-stop shop for helping you decide where you’re going to be. Always be in the know, and #BeThere with Tabeso! Are you a Venue or Organization and want to get your Events listed on Tabeso? Go to tabeso.com and we’ll get you dialed in!